2018 has already given us a host of unmissable films - including The Shape Of Water, Lady Bird, You Were Never Really Here, I, Tonya, Black Panther, Phantom Thread, Coco, The Square, A Fantastic Woman and Annihilation. I love the premise of John Krasinski's film A Quiet Place (starring Krasinski himself, Emily Blunt, Noah Jupe and Wonderstruck's Millicent Simmonds). A family of four must navigate their lives in silence after mysterious creatures that hunt by sound threaten their survival. If they hear you, they hunt you. I cannot wait! The cast of Cory Finley’s film intrigues me as much as its story about a complicated friendship. The trailer is pretty diverting too. Thoroughbreds is also noteworthy for being the last movie to feature the extremely talented Anton Yelchin who tragically died aged 27. I am so looking forward to Robin Campillo’s film about advocacy group Act Up Paris. In the early 1990s, the group demanded action by the French government and drug companies to combat the AIDs epidemic. 120 BPM has been wowing audiences and winning prizes since its premiere last year. I saw Todd Haynes’s film at the BFI London Film Festival last year. This is a visually beautiful movie with a superb central performance from Millicent Simmonds and another stunning score from Carter Burwell. While it didn't quite work for me, Ghost Stories does feature a brilliant cast (including Alex Lawther, Martin Freeman and Paul Whitehouse) and is an admirable return to a more old fashioned style of spooky storytelling. I am really looking forward to Greg Berlanti's film starring Nick Robinson, Katherine Langford, Jennifer Garner and Josh Duhamel. It tells the story of seventeen-year old Simon Spier who has yet to tell his family or friends he’s gay and doesn’t actually know the identity of the anonymous classmate he’s fallen for online. In this fantasy horror from director Fritz Böhm, a teenager uncovers the dark secret behind her traumatic childhood. This intriguing film stars the always brilliant Bel Powley. I love director Claire Denis and so am intrigued by her latest film starring Juliette Binoche. Isabelle - a Parisian artist and a divorced mother - is looking for true love. I know very little about Mike Newell's film - apart from its rather unwheldy title and the fact that it stars Lily James and Matthew Goode. The movie follows a writer who forms an unexpected bond with the residents of Guernsey in the aftermath of World War II when she decides to write a book about their experiences during the war. No surprise to find Infinity War on this list. I cannot wait (really, really cannot wait) to watch the next instalment in the Avengers story... although I am rather anxious about which of our beloved superheroes might not make it past Thanos. 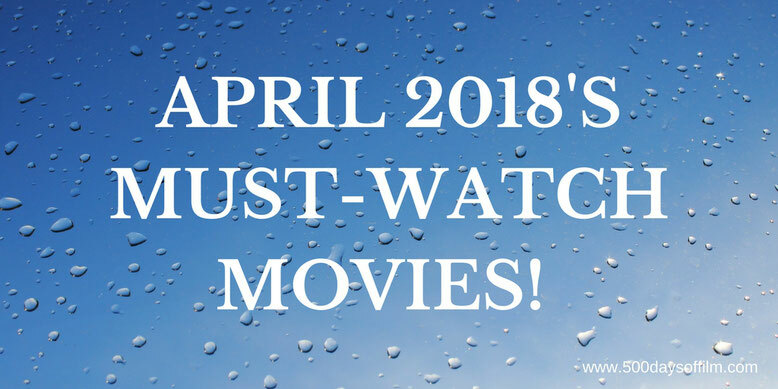 What Are You Watching In April? What films are you most looking forward to watching this April? Let me know in the comments section below or over on Facebook or Twitter (@500DaysOfFilm).